Another season without ''the big'' British names on the schedule and things were alright - again. Another opportunity for the young designers to 'shine' and attract the international media with their work. Three days full of shows, presentations and parties…. and before Milan Fashion Week here are the higlights from day 2 & 3. Women presented menswear in Mullins’ AW19 show which was one of our favourites. 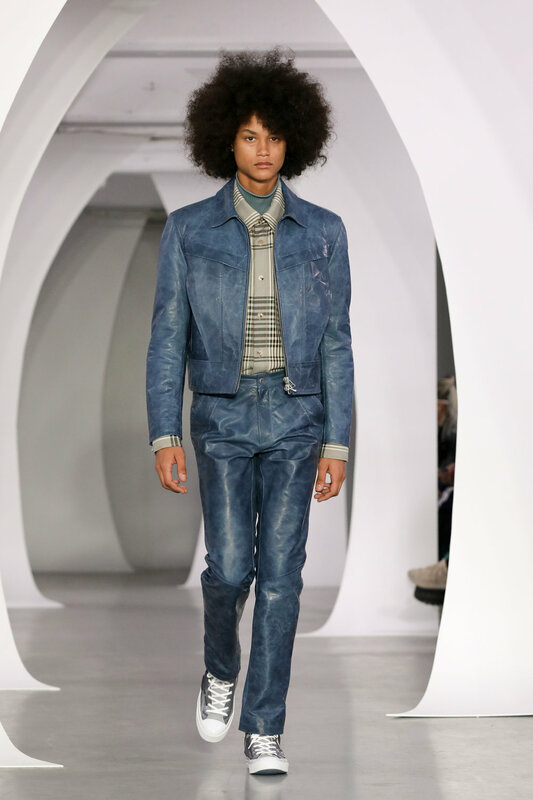 Mens pieces became Gender fluid in terms of styling with denim and tailoring being the key elements of the collection. The colour pallete consists of blue, yellow, oatmail and graphics in red and black details. Streetwear meets luxury fashion in Astrid Andersen with blue, red and orange being the main colours of the AW19 collection. An exploration of the classic male silhouette and the pin stripe tracksuit, the Autumn/Winter designs are an ode to 1920s’ American fashion, a step away from the label’s previous inspirations. However, despite its new unexpected design, Andersen remains comfortably rooted in the materials used in even her earliest collections, in particular her signature combination of lace and fur. In a celebration of artisanal making and craftsmanship, the designer showcased his signature expressive draping techniques, as well as a unique take on deconstruction. Relaxed silhouettes – as seen for instance in a double-breasted Prince of Wales check blazer with crisp white cuffs peeking out from the sleeves – exercised both precise construction and soft tailoring. The colour pallete was in soft tones with apricot, dusty lavender and off white being the main colours of the collection. A very thughtful but playful collection which came from the future for the future. From prosthetics used on models from ‘alien’ eyes to bionic components the Xander Zhou AW19 was the favourite one on instagram. The clothes were a beautiful paradox too – modern men accessorising with flippers and furry feeding bottles to engineers donning 70s-esque polonecks. The collection overall has a hopeful message, one of belonging. Accepting the ‘other’ is the future..
Eco-wools, tailored coats , utilitarian bomber jackets and velvet trousers were some of the statement pieces of the AW19 collection in OLIVER SPENCER show. The earth colours were on top with many blue tones too and the ‘eco-green’ on its best. We loved the suits and all the tailoring he proposed like every season with the Royal Academy as the show venue being one of our fevourites this year. History and heritage permeates the AW19 FENG CHEN WANG collection through the symbolism, iconography and painting with brush strokes, turning her artistic ideas into design prints and forms. In a collection of 41 looks, Fend Chen Wang’s textures and palettes are as pure as the story their telling – from pale pastels to soft fabrics, there was bold tailoring to portray strength and oversized shapes to show creative power.